Summertime is finally here and in full swing, and as a result, people from everywhere are travelling to the beautiful coasts of Florida to hit the beaches and the waves. Residents of Florida are joining them, as no one can resist the fun-in-the-sun that this great state offers. However, while swimming, boating and watersports in general can be great fun, they can also be dangerous, especially jet skiing. At Spencer Morgan Law, our Miami maritime and boat accident lawyers routinely see clients who have been severely injured in jet ski accidents that have left them broken, burned or even permanently disabled. We hope that by sharing with you information about a few of the more common jet ski injuries as well as tips on how to prevent them, we can save you from having to deal with the after effects of a possibly life-changing accident. Spinal Cord Injuries: In extremely bad accidents, jet ski drivers are thrown off the personal water craft at high speeds, severely damaging their spinal cord and potentially causing life-long injuries. Concussions: Concussions are the most common jet ski injury. A concussion occurs when a person experiences a severe blow to the head. If a jet skier is thrown off their personal watercraft into very dense water and at high speeds, they may become concussed. Sprained or Fractured Ankle or Broken Wrist: If a rider tries to break their fall by reaching out a limb, they may unintentionally break or fracture a bone instead. Burns: If the jet ski ignites during a crash, the jet skier and other involved parties may suffer from severe body burns. Maintain Your Watercraft: If you own the jet ski and did not rent it, make sure that it is properly maintained before hitting the water. You do not want to end up a sitting duck in the middle of the ocean because you failed to check that your gas tank was full or your battery was fully charged. Wear a Lifejacket: Even if you are a great swimmer, the ocean is unforgiving and can wear even the most advanced swimmers out if they are stuck out in the water for long enough. Prevent drowning by always wearing your lifejacket when out on the water. Don’t Drink and Boat: Many boating accidents, as with car accidents, could have been entirely avoided if one or more parties had just avoided alcohol. In fact, according to sources, alcohol is the leading known cause of boating fatalities. Avoid drinking when out on the water entirely. Slow Down: Speed is another leading factor in jet ski deaths, as is driving too closely to another vessel. Maintain a safe speed, and keep a safe distance from other watercrafts. Determining liability in a jet ski accident in Miami will all depend on a number of factors, including who was involved in the accident, who hit who (if there was a collision), and whether or not any negligence was involved. 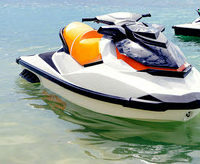 If the accident occurred because of a malfunction with the actual jet ski, the lawyers—both yours and the insurance company’s—will look into whether the malfunction occurred because of improper maintenance or because of a design flaw or manufacturing mistake. If you or a loved one was injured in a jet ski accident, the first thing you need to do is seek medical attention. Not only is this the smart thing to do for your health, but also, medical records will be critical if you decide to file a personal injury claim. Next, reach out to the Miami maritime and boat accident lawyers at Spencer Morgan Law for a free evaluation of your case. You may be entitled to compensation for your injuries; to find out for sure, contact our team at 305-423-3800 today.